How can DIY Doctor be free? This is a question we often get asked by users of our site. 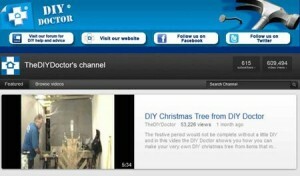 We make DIY Doctor a free website for our users by selling advertising space. This is the same as most websites, but we always try to make sure that the products and services we list on our site are of interest to our users. London Fashion week is over, but we are all slaves to fashion in some way. The internet is no exception, with videos being the latest high-growth area of many websites. Streaming sites have made it really simple to upload videos, and have become very popular places to learn new skills, and check out new products. DIY Doctor is no exception to this craze, and we love making videos to help users complete Home Improvement jobs and choose the correct tools for the job. DIY Doctor has started using a new publishers revenue company, Coull Vidlinkr to help to increase our revenue by collecting sponsors for our YouTube videos, which review DIY products, or provide instruction guides on how to perform a particular home improvement task. Making money from our videos this way means we can use the funds to make more videos, and so continue to increase our video library for our users. Once we installed Vidlinkr on the DIY Doctor website, it automatically picked up our YouTube videos and added a link to pre-approved tool suppliers pages. We are happy to recommend the links on the video, knowing that they are relevant to our users, and offer them good value for money. This enables the viewer to purchase products recommended by us, and ones that are necessary to complete the DIY task, straight from the video. These have been very encouraging for us and we can recommend the services offered by Coull Vidlinkr to anyone who needs to make money from their blog or website. Although we would be careful to stress that the content must be of use to your readers and users. Strong clickthrough rate: At 2.7%, DIY Doctor’s strong clickthrough rate shows how a relevant call to action within a video can engage viewers. Superb conversion rate: At 8.2%, their excellent conversion rate, from clickthrough to purchase, highlights the way viewers use video as a resource in their consumer journey. It drives demand for products. Average commission per transaction: The average commission earned by DIY Doctor per transaction was £1.89, reflecting the earning potential for bloggers using Coull Vidlinkr. This video link, below, shows that the users experience is subtle enough to be informing without being annoying. Let us know what you think – click on the comments link at the top right of the page. Do you have a Grand Design to brag about?